The first week’s theme centers around “Fresh Start” and immediately several things came to mind – namely, what person or family do I want to look at with fresh eyes? 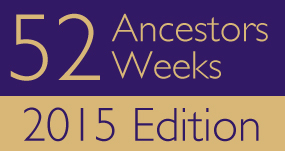 It is the family of my second great-grandfather’s brother, James J. Johnson, who is a collateral ancestor. Instead of writing about the family in this post, I’m going to list those things which I have documented because I can’t get a “fresh start” unless I only state what is true (according to the sources). 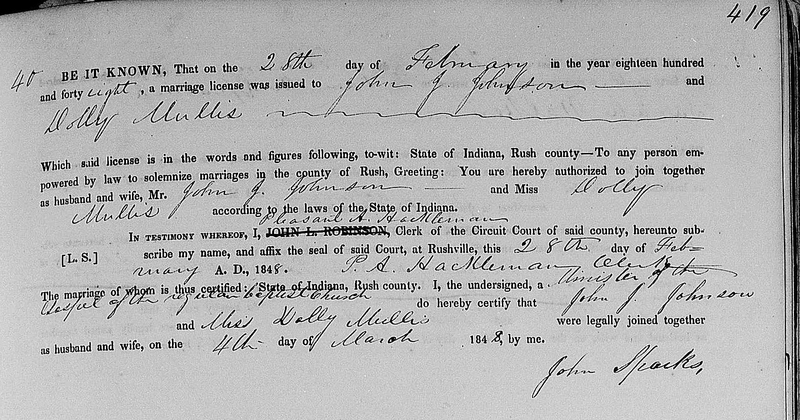 On February 28, 1848 James J. Johnson and Dolly Mullis were granted a marriage license in Rush county, Indiana and married on March 4, 1848. John J. Johnson is listed by name in the 1850 Census enumerated on September 7, 1850 living in Union twp, Rush county, Indiana. He is listed as age 27 making his birth in 1823 and lists his place of birth as Ohio. His occupation was farmer. Living in the household was Dolly Johnson, age 25, born in North Carolina, and could not read or write. A one year old child, Ann M. Johnson, born in Indiana also resided in the house. In 1856, John J. Johnson is listed as guardian for Jemima E. Johnson, his younger minor sister after the death of their father, Jacob Johnson. On July 29, 1870 J. J. Johnson was enumerated in the 1870 Census. He was living in Stony Creek twp, Madison county, Indiana. Johnson was a 47 year old farmer, born in Ohio, with a personal income as $900 and a real estate value of $4000. Others in the household included: Dolly Johnson, age 44, born in North Carolina; 12 year old Rosa A. Johnson, listed “at home,” born in Indiana, and had attended school in the last year; and John J. N. (or J. M.) Johnson, age 7, listed “at home,” born in Indiana, and attended school within the year. Two others in the household included: 55 year old Sophia Mullis, born in North Carolina, with a personal property value of $1400, and who could neither read nor write and Thomas Mullis, a 42 year old farmer born in North Carolina, with a real estate value of $3000 and a personal property value of $2000 and could not write. On June 11, 1880, John J. Johnson is enumerated living in Stony Creek twp, Madison County, Indiana at age 57. He is a farmer, married, and born in Ohio. He lists his father as born in New Jersey and his mother born in Pennsylvania. He is living with his wife, Dolly Johnson, age 55, who was born in North Carolina as were both of her parents. Daughter, Rosa A. Milburn, is age 22, married, born in Indiana. She lists her parents as born in Ohio and North Carolina. Son, John M. Johnson, is a farmer age 17, born in Indiana, and lists his parents born in Ohio and North Carolina. Grandson, Edward D. Milburn is age 3, born in Indiana and his parents are listed as born in Indiana. The History of Madison County lists the story of how John J. Johnson’s neighbor, Coleman Hawkins, tried to kill him on the night of December 5, 1888. The article mentions that Johnson had been a postmaster in the area of Johnson’s Crossing near Stony Creek twp in Madison county, Indiana and mentions Johnson’s daughter, Miss Rosa Johnson. John J. Johnson’s obituary on the front page of the Anderson Democrat on October 14, 1892 stated that he died instantly while sitting in a chair after he had returned from visiting a daughter in Knightstown. The physical description of him said that he was over 6 foot tall and large in proportion. Dolly (Mullis) Johnson is listed on the 1900 Census as still residing in Stony Creek twp. She is a widow and the mother of 5 children but only four living. The obituary for Dolly Johnson that ran in the February 25, 1908 edition of the Anderson Herald states that she was 82 years old and was survived by four children. It mentions that she was the widow of John Johnson and died at her daughter’s home – listed as Mrs. Charles Anderson. Besides that daughter, listed later as Rosa Anderson, the other children who survived her are Martha Johnson, Mrs. Jonathan Delawter, and Mrs. Mary Reid. What strikes me are two things – one, until I can locate this family in the 1860 Census, there are several questions and two, I believe the names of the children that survived Dolly Johnson are wholly inaccurate and lacking – but…since I’m looking at this family with fresh eyes, I have to consider all the possibilities. Even though it is not documented proof, I do have a list of people who attended the Johnson reunion in 1915 & 1916. 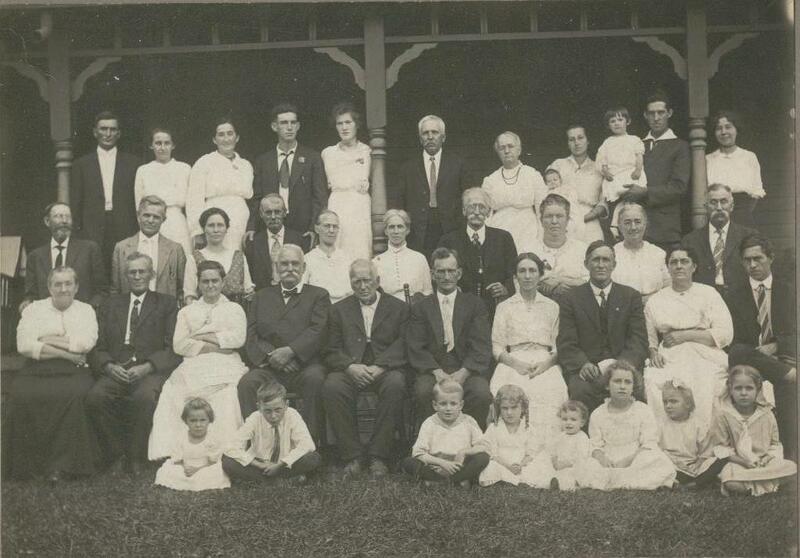 This list is a good indication as to who were considered to be “family.” Included in the photo with a key to the who is who on the back are Rosa Anderson (3rd person from the left on the 4th row standing), Mrs. Delauter (1st person on the left on the 2nd row sitting), Mrs. Marshall Johnson (9th person from the left on the 3rd row standing), Mr. Marshall Johnson (10th person on the left on the 3rd row standing), and Mr. Delauter (1st person on the left on the 3rd row standing) (as well as my grandfather and his parents). I am pretty confident that Marshall Johnson is John Marshall Johnson, son of James J. Johnson and Dolly Mullis. There is a marriage record on FamilySearch.org for John Marshall Johnson and Rosa J. Hawkins on December 17, 1881, as well as marriage records for some of their sons that lists their parents as: Marhsall Johnson and Rosa Hawkins, Marshal Johnson and Rosa Jean Hawkins, J. M. Johnson and Rosa Jane Hawkins, and J. M. Johnson and Rosie J Hawkins. I also believe that Rosa Johnson Milburn Anderson was their daughter due to the entry in the History of Madison County concerning the attempt on her father’s life by Coleman Hawkins; she was enumerated as living in their household as “daughter” in the 1870 and 1880 Censuses; and she attended the first reunion in 1915. In the above three cases, those who survived Dolly (Mullis) Johnson seem to be correct. What about the mysterious “Martha Johnson” or “Mary Reid”? And why wasn’t John Marshall Johnson listed? And why was there no mention of the 1 year old child – Ann M. Johnson – who had appeared in the 1850 Census with John and Dolly? Who provided the information to the newspaper for the obituary or did someone at the paper take it upon themselves to write it up and perhaps print the wrong names? Further research that I need to do before making a conclusion according to this family: find the family in the 1860 census, any land records or deeds, obituaries or news articles, marriage records, better death records, and birth records if they exist. Oh where, oh where, are you – descendants of this couple through any of the three children listed above or any children that I haven’t documented?